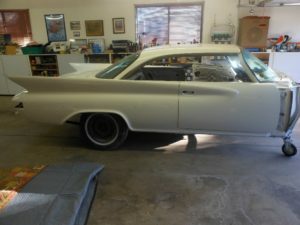 I am responding to the overwhelming amount of communication coming in asking me to give an update on the progress of the restoration of my 1961 Chrysler 300G. I must confess that I am very easily overwhelmed. Let’s do a quick review. 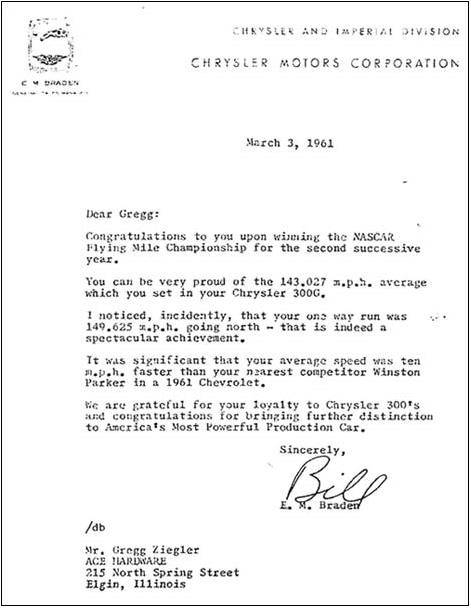 The 300G was one of the best and also the last of the Chrysler big fin cars. 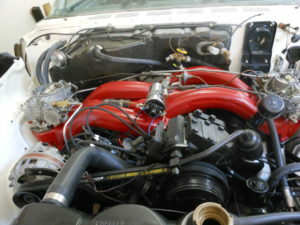 It has a 413 cubic inch engine with the unique cross-ram intake manifold and dual four barrel carbs. It develops 375 HP and 495 lb ft of torque. It will easily get 10 miles to the gallon with its three speed torqueflite transmission. With high test gas at 37 cents per gallon, this was an expensive car to drive. Filling up the gas tank could cost you over eight dollars. I plan to run it on 1961 gas as soon as I can find a station that still sells it. 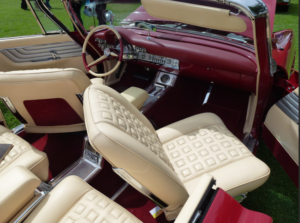 A really nice feature is the swing out bucket seats as shown in this convertible. This old man much appreciates that! They used to swing out automatically using a cable when you opened the door. But after some poor souls inadvertently got dumped on the highway in the prior 1960 F version, Chrysler changed the design so you have to swing them out after the door is opened. Makes sense for safety’s sake. I bought the car in October 2017 from Rich Clapham, who kept it in a covered storage since 1977. When I looked past the grunge and some missing parts, I saw a car that was totally rust free. That is the gold standard if you are going to restore an old car. Nothing costs more in a restoration that the replacement of rusted out body work. If the body is rusted, you can bet everything else will have some corrosion. Of next importance is existence and the condition of the trim pieces on the car. With today’s environmental rules having driven most of the plating shops out of business, you have to ship the chrome parts out of state. It is not unusual to have to pay over $10K for reconditioning and plating. Fortunately, the chrome trim on the car was removed and stored, and it is in excellent shape; all it requires is a cleanup with lacquer thinner and a light buff. Rich had one of the bumpers re-chromed several years ago, so that saved a big expense for me because the bumpers are huge. I think there is enough steel in the bumpers to make a Honda Civic!. The 1960s was an era when “road hugging” weight was prized. When driving around a curve, it kept those bias ply tires pressed into the pavement right up to the time that you plowed off the road and through the guard rail while making the squealing noise that you hear on old movie sound tracks. Stainless steel trim is handled different that chrome trim. It usually has no rust, but it does have surface contamination that has formed over the years. It also tends to have small insults in the form of dents. An important thing to realize about dents in stainless trim is that they are much easier to put in than take out. Taking them out is a time consuming and delicate process, which involves punch and hammering plus sanding and grinding followed by multiple buffs on a high-speed cloth buffing wheel. 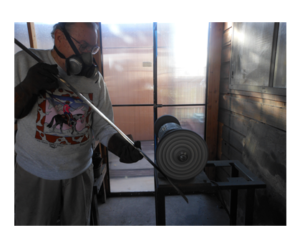 The buffing wheel is a fool’s delight as you have to be VERY careful how you hold the trim piece. Catch an edge and a part of your finger can join the trim piece as it rockets to the floor or gets speared into the wall. My goal was to do a “pregnancy” restoration. This means that I wanted to be finished 9 months after I started. Women are really good at meeting their timeline, but I ran into difficulty with mine. Back in the day, I could do almost all the heavy work by myself, but that day has passed. Bending over is easy for me but returning to a vertical position can be problematic and not without distress. That is where a nice young man by the name of Dustin Price comes into the picture. 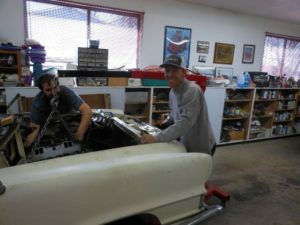 He is a well-qualified mechanic with a lot of experience in normal automotive maintenance and likes to work on hot rods, customs and restorations. I give him an incentive wage, free beer and a good lunch. I get the parts and tools and hand them to him, while he puts them on the car. You might be surprised to know that I go full time in order to stay up with him by locating parts, prepping them and cleaning or obtaining fasteners plus managing the tool chest. I also do the special machining when some stray parts need attention. A frozen or broken bolt needs some love from the milling machine in order to join the more polite fasteners. We were really knocking out the restoration tasks with Dustin working weekends, in addition to some evenings. Then something happened. It seems Dusty got a really high paying job as a diesel mechanic maintaining oil patch engines, which are the big engines that shake the ground. I was very happy for Dustin except he now has long hours and continuous days on the job with a variable schedule. Using his “catch-me-as-you-can” hours, we were able to complete the mechanical work and get the car back from the paint shop all nice and shiny in its arctic white paint. For this car it made sense to remove the power train while attached to the unibody via a sub frame. It turns out this is actually the easy way to overhaul engines and transmissions as it makes everything totally accessible. While this work was being done by specialty shops, I had the sub-frame powder coated. We put on all new suspension parts and did a drum-to-disk brake conversion. The car should handle as good as, or better than, new. When you take a car apart and see it totally stripped down, it reveals its history to you, just like a scar on your belly from an appendix removal reveals a past medical problem. In my case, the driver’s door had a manual window crank, while all the other windows were powered. Inspection of the cowl revealed that a bad “oops” had occurred, and the door was replaced, and the cowl straightened. We had to upgrade that door and put in a power window. Fortunately, all the glass is good since a new windshield can set you back well over ten Benjamins. I also found some other replacement parts installed, but overall, the car was in really good condition and very ripe for restoration. A big milestone is the first start and run-in of the rebuilt engine. On TV shows and You Tube videos, I see all kinds of antics as people try and start a newly rebuilt engine. They grind the starter to death and have flame backfire through the carburetor. I set up the engine, and Rich came over to run it. After a hefty prime, it fired right up, and we ran it at a very high idle for 30 minutes to break in the cam. My big ex furnace fan eventually cleared out the smoke as the assembly lube burned off. The engine sounds a little mean, very powerful and ready to do some serious travel. An unfortunate cow(s) surrendered its birthday suit to provide the full leather hides to reupholster the seats. Upholstery of the seats and the side panels along with carpet installation was best left to Chris Monaco a seasoned professional. It is the final phase of restoration, and that is what is being worked on now. This is the time when it seems like the tasks will never end, and you are starting to get sick of doing all the work required, but we are actually pretty close to completion and should be doing brake testing and carb tuning pretty soon. ONE HUNDRED FORTY THREE – YES!! I will buy some insurance, stick on a license plate, and be off to see the world. Please be a good sport and clear the road for me. I wonder if this car really can do 143 mph? I can’t wait to find out … Want to take a ride? 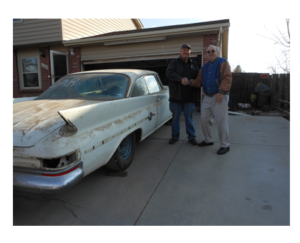 This article was published in Bootlegger Book Blog and tagged car restoration, Charles Clark, hot rodders, hot rods.